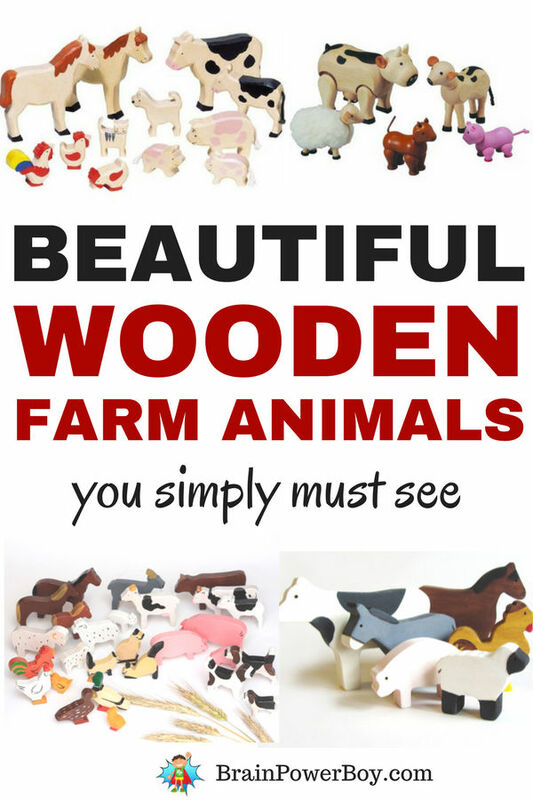 Wooden Farm Animals That Are Too Wonderful To Miss! 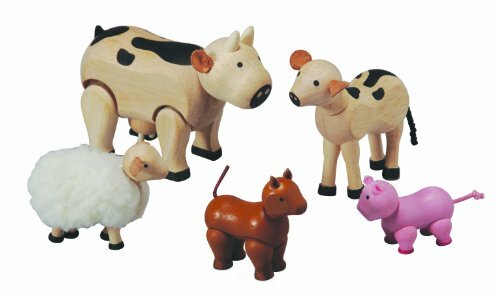 I picked out these wooden farm animals to go with the wooden barn posts we wrote here and here but they can certainly used on their own. When I was growing up we had a wooden barn with a lot of farm animals. I have great memories of play with that toy! 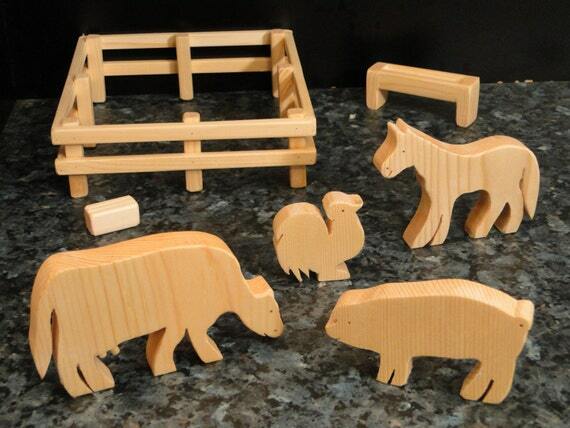 I am sure the person you are shopping for will have fond memories of playing with these animals. They are something special. 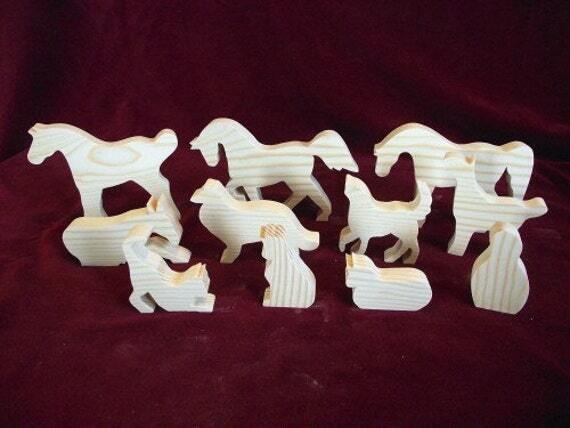 Those of you who like to support the artists who create handmade wooden toys can scroll down a bit to the handmade section. This set is by Plan Toys. They are a favorite company of mine and have been for many years. We have written about their doll house and their barn. I love these farm animals! The heads and legs both move. These are made of rubber wood. We have this set and it has lasted for years. I want you to take a close look at the sheep. Do you see the little slit at the front? It is made so you can slip off the wooly part when you “shear” the sheep! How cute is that?! Little details like that make Plan Toys a company that I always turn to. 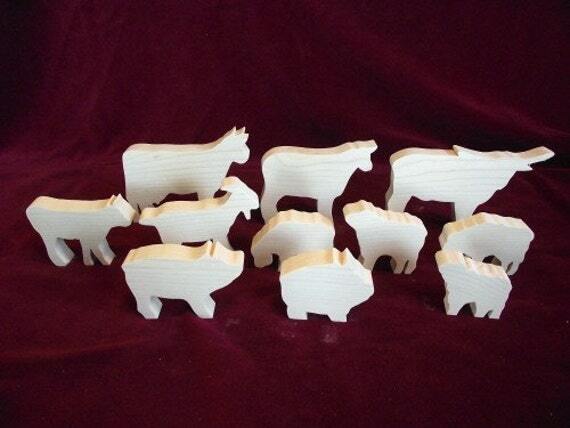 The farm animals shown below come in a set of 12. They are simply styled and colored. The other animals are pretty great as well. They are all painted with acrylic water-based paints. 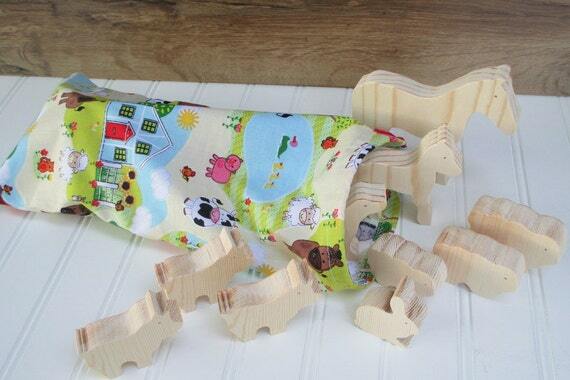 This section is full of beautiful, durable handmade animals. Please check the items for the type of wood and paint used in the pieces. Each artisan uses different materials. Also note that handmade toys have a longer wait time before they arrive at your home (but they are totally worth the wait!) Some are made once the order comes in. If this is an issue for you, I suggest the two sets above which ship quick from Amazon. The next sets are unfinished which means you, and/or your kids, can stain them, wax them, or paint them however you wish. Or leave them unfinished if you like! This Etsy seller has three reasonably priced sets that I think you will like a lot. 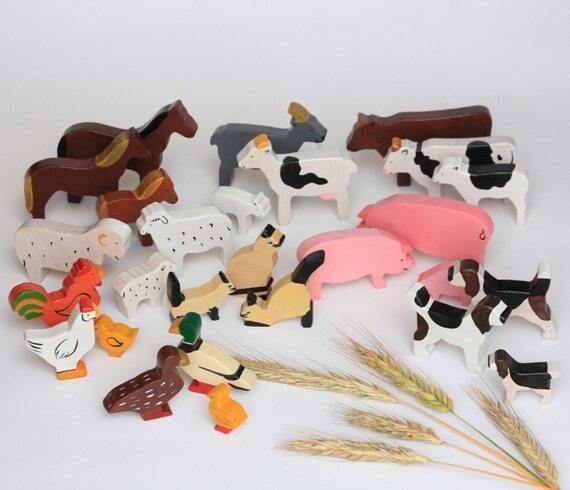 These sets combined have every farm animal one could want. The simplistic style will appeal to those who are more minimalist, or like primitive-style toys, as well as those who like natural toys for their kids. 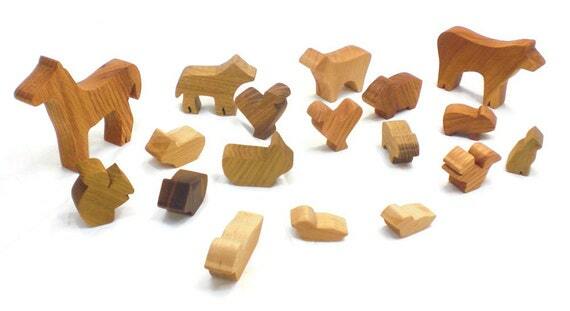 The next set features 10 animals. 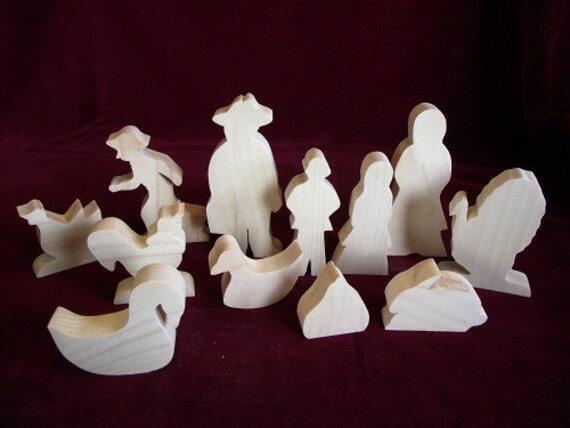 All are unfinished and made of pine. You get a horse, colt, cow, calf, bull, turkey, rooster, hen, goose, billy goat, milk goat, dog, kitty, sheep, pig and a donkey. A nice selection! 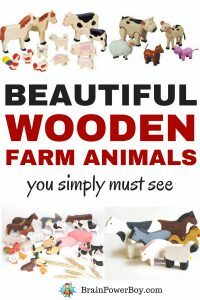 If you want natural wooden farmyard animals but don’t want an unfinished set like those above, you should take a look at these. Happy Bungalow uses a variety of woods to get the beautiful look you see below. They are then finished with linseed oil. Go here to see the wood types. 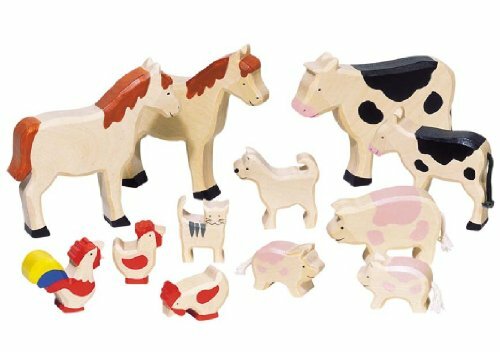 This simply styled set includes a horse, cow, dog, cat, sheep, pig, rabbit, duck, two chickens, two squirrels, two bunnies, two little piglets, and two baby ducks for a total of 18 wooden farm animals in all. They come in a cloth bag. I’m going to tell you straight out that these are not cheap. They are, however, beautifully done. Just look at the details! I love that there are families of animals. That, and the colorful hand painting is what drew me to them. If you are willing to splurge a little bit or want to give an extra special gift, this is a top choice for you. There is a smaller, less expensive set there as well. How best to describe this set? I’m going with simply adorable. These are listed as Waldorf and eco-friendly. These ship from Indiana and are made to order. This is a top pick for those with a low budget. You are not going to believe the price of this set! It is a bargain and a super great value. It comes with a cow, horse, pig, rooster, hay bale, feed trough and a fenced in pen. I like the feed trough and can see that getting used all the time. None of the other sets have that. 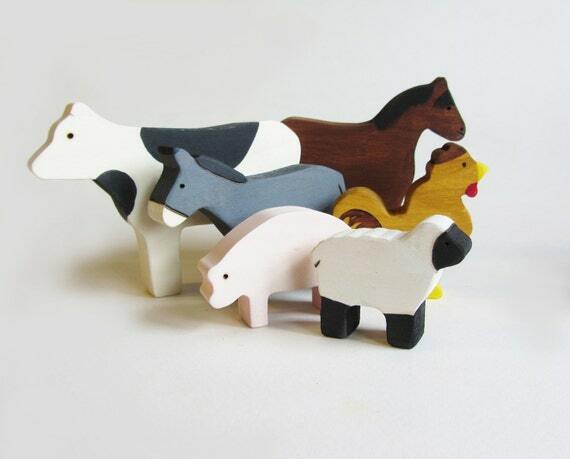 If I were buying one of these wooden farm animal toy sets right now I would have a hard time deciding! They are all wonderful for their own unique reasons. Pick the one you like the look of and that will match a wooden barn that you are interested in or one that you already have. I just know your kids are going to have years of fun with these!